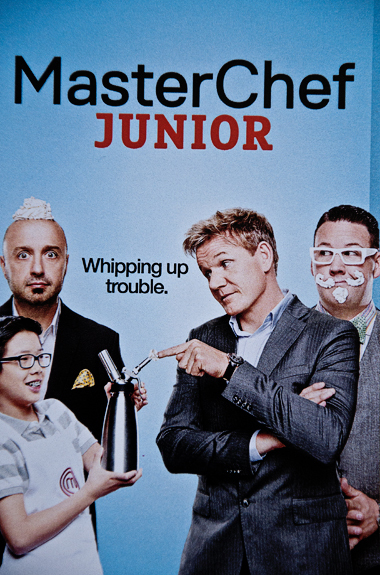 MasterChef Junior Season 2 Starts Today And Giveaway For Our Readers! A new season of MasterChef Junior will premiere on FOX on Tuesday, Nov 4 at 8/7c. We all really enjoyed the last MasterChef Junior in our house so we are looking forward to finding out what this season brings. The contestants are aged from 8 to 12 years old and to be honest I am amazed at what they can do. With most kids of this age barely being able to put together a sandwich this show is an inspiration. And of course it helps that my favorite chef Gordon Ramsay (well I am British so biased) and Joe Bastianich and Graham Elliot are there to help the contestants along the way. The prize for the young master chef is a cool $100,000. We also have a giveaway for our readers so they can have fun whilst watching the new season. It is a lot of fun and includes everything you need to make a big bowl of popcorn to enjoy whilst you curl up on the sofa and watch the new MasterChef Junior season. The kit is a lot of fun and has a jar of popcorn kernels with some very cute popcorn boxes, a chef’s hat, measuring spoons, flavorings including garlic powder, cayenne pepper, rosemary and cinnamon. Also included are two really cool glass jars so that you can put your own seasoning on them. And last of all some recipe cards so that you can inspire your very own junior master chef. We received a free Popcorn Giveaway Kit for writing this review. Our opinions as always are our own! 25% Off Your Entire Purchase @ Elegant Mommy!